Say hello to what is arguably one of the most versatile design options in your photo book creator: the Mask! Ever used it before? You should. 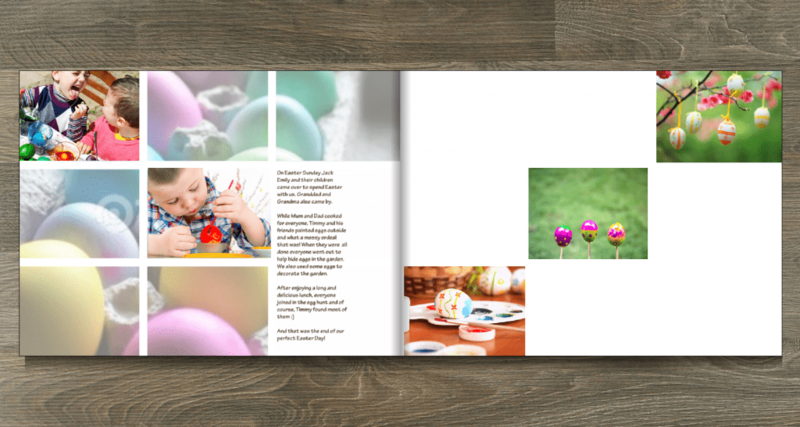 It’s the easiest way to create designs for your photo book that are bold, creative and fun. To show you what we mean, let’s take a look at what the Mosaic mask design can do for you. First create a folder with a collection of photos you wish to use across two pages in your photo book. The collection should contain one photo, which you’ll use as a background. It’s usually a good idea to pick one that’s thematic. 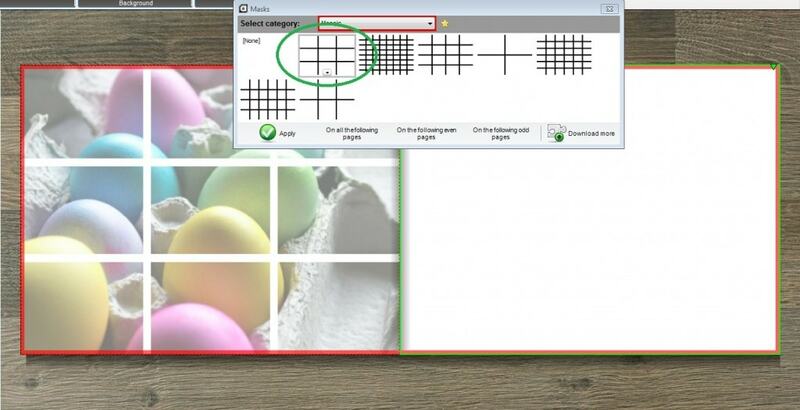 In our example spread above, we picked a photo of Easter eggs for a photo book about Easter holiday. Once you’re done, start your creator tool and use the photo navigation on the left to select your chosen background photo. To add it as a background, click on the photo, then head to the menu bar above and click the ‘Insert’ tab then the ‘As background’ button (as seen in the image below). This will add your photo as a background on one page. The next step is to apply the Mosaic mask over the background. Head to the menu bar, click the ‘Mask’ option and use the drop down menu to select the Mosaic design element you wish to use, and click ‘Apply’. In our example, we opted for the one circled in green below. If you can’t find the Mosaic mask options, click ‘Download’ to add them. Now just let your imagination take over! 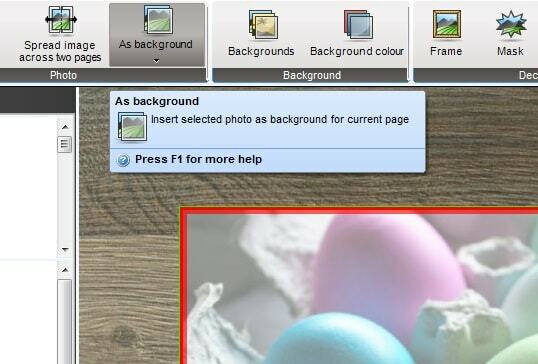 Use the ‘White’ colour clip art (circled in green below) to decide where you’d like to add photos and notes over your newly created layout. By the way, clip art is now available for Mac users as well! 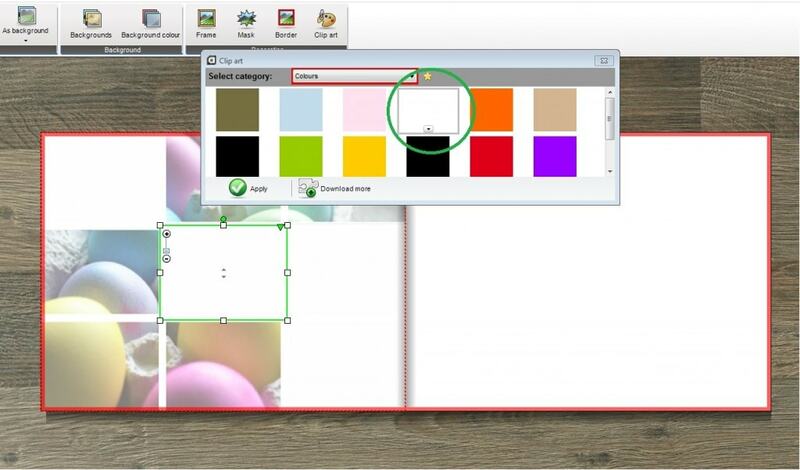 Complete the pages by simply inserting photos and notes wherever you like. To align your photos correctly, use the red grid lines that appear when clicking on a photo and holding down the mouse button. Are you a Mac user? Then these steps are slightly different for you. The photo book creator tool for Macs will look more like this and you’ll find the Mosaic mask option under ‘Assets’ button (top-right corner) > ‘Masks’ > ‘Mosaic’.